1. Merida points out that Nauplius Brassard chose to name her Helen. Do you think this is because she’s beautiful or because her face starts a war of sorts upon his death? 2. Nauplius Brassard paid for Merida’s facial reconstruction. Why do you think Nauplius created the most beautiful woman in the world? What do you think of men who value women based on their youth/beauty? What do you think would have happened if Nauplius had lived long enough for Merida’s looks to fade? 3. 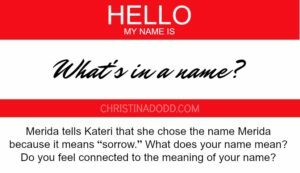 Merida tells Kateri that she chose the name Merida because it means “sorrow.” What does your name mean? Do you feel connected to the meaning of your name? 4. Merida’s inability to speak is psychosomatic, meaning it has a psychological instead of physical reason. Have you ever survived a situation or injury that fundamentally changed you, perhaps even injured you in unseen ways? How did you go about healing? 5. Before arriving in Virtue Falls, Merida transforms herself into a punk/Goth in order to hide her identity. Have you ever drastically changed your appearance? What were the reactions of your friends, co-workers and family? 6. Kateri and Merry were friends for a very short period of time as children. For both, though, the friendship had deep impacts. Can you recall a friendship in elementary or middle school that profoundly changed your life? 7. Merry admits that before the accident that ruined her face and her life, she believed in the inherent goodness of mankind. Do you believe in it? Why or why not? 8. Merry Byrd believes, partly because of her name, that she’s meant to fly planes. Do you feel you have a destiny? Tell us what and why. 9. Merry Byrd makes up a story about Amelia Earhart being her aunt. What is a story that you told yourself and/or others as a child? Were you believed? 10. Stag Denali is Virtue Falls’s resident bad boy. Do you enjoy reading a bad boy character? What do you think of “bad boys” in real life? 11. Kateri tries to remain friends with Luis after they break up. Have you ever attempted to be friends with an ex-boyfriend? Were you successful? 12. Kateri points out that her half-sister, Lilith, has to establish dominance early in an encounter (in this case, by forcing Kateri to hug Lilith.) Have you known anyone who similarly felt the compulsion to dominate? Did you fight it, or give in as Kateri does? Is giving in weakness or wisdom? Discuss your reasoning. 13. Kateri and Lilith have a bitter sibling relationship, but in the end, Lilith stands up for Kateri. Do you have a sibling? How would you describe your relationship? 14. Kateri’s cold and distant father forces her to leave her loving mother and the wilderness that is her home in order to live with him in Baltimore. Have you been torn between your parents, or forced to move from the place you called home to another, strange and terrifying place? How did those changes affect you? 15. Kateri’s mother is named Mary. Do you believe this has biblical connotations as, in this case, Mary gave birth to the Frog God’s chosen goddess? 16. Rainbow indicates that she feels trapped in her coma, listening to everything happen around her and unable to react. Do you believe that a person in a coma can hear what is being said? If you found yourself in such circumstances, would you feel frustrated? Terrified? 17. Kateri saves Rainbow with the power given her by the Frog God. Do you think she actually got power from the Frog God, or was her power her deep and abiding love for Rainbow? Do you believe in miracles? Or was Rainbow’s timely awakening no more than her own healing combined with coincidence? 18. Dawkins and Elsa Cipre are the type of couple where their interactions are rife with mansplaining and ego stroking. Have you known couples like this? How have you reacted? 19. The Gem Lounge is the town’s version of Cheers — the bar where folks from town go to feel at home. Is there a place like that in your town? 20. Benedict’s aunt and uncle are so immersed in business that they lack compassion or humanity. Have you ever known anyone like this? 21. The author has stated she created the Frog God out of her own mind. Do you think the inclusion of a paranormal element enriched this suspense series? Did you see the Frog God as a religious symbol, symbolic of the divide between man and nature, and/or a cultural paragon of the Native American culture? Discuss. 22. 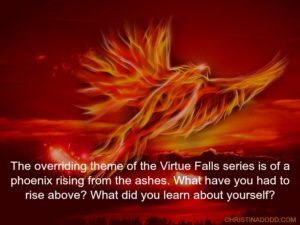 The overriding theme of the Virtue Falls series, of a phoenix rising from the ashes (as Kateri does after being taken by the Frog Godand as the town itself does after the earthquake), is repeated in Merida’s story. She has to rise above the past multiple times (her foster parents, her near death experience, her marriage to Nauplius). What have you had to rise above? What did you learn about yourself in the process?